McLean, VA: Amber Go Game stone set with wood bowls – $80; Go Game Marble bowls with glass stones – $40; Thick Agathis wood Go game board – $110; Go game Weiqi stone and wood bowl set in a case – $100; Go game stone YunZi set in wood box – $50; Go game wood folding board – $20 (McLean); Go game travel set – $20. A tournament report – including updated ratings and all game results — for the 2012 New Jersey Open (NJO) has been posted online. The final count for the NJO – held February 25-26 at Princeton University in Princeton, NJ — was a record-shattering 131 registered players, including college students from Stony Brook, Cornell, Rutgers, and Princeton. Many current and former students of the Feng Yun Go School participated, including the overall winner, Michael Chen, and runner up, Ricky Zhao. 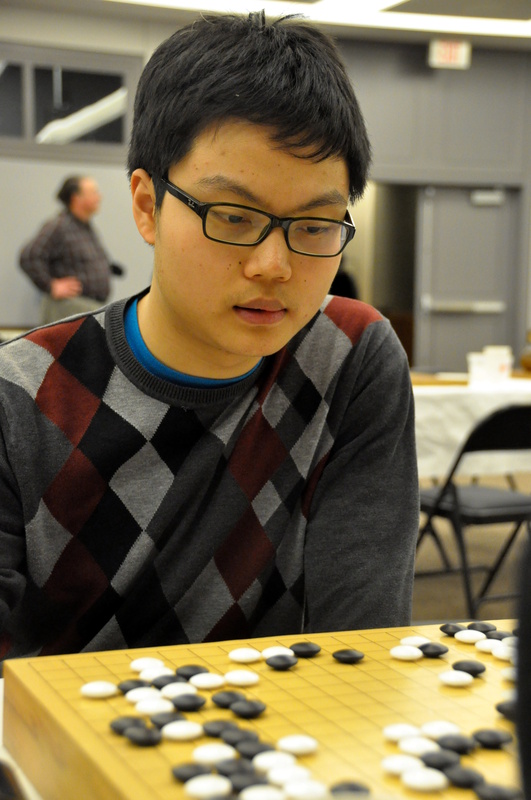 Chen is a recent graduate of Princeton University, where the tournament is held and Zhao has been accepted by Princeton. In addition, the Bob Ryder Memorial Beginner’s Prize, a fine complete go set, was given by random drawing to Daheng Shen 23k. The New Jersey Open was organized by Rick Mott and the Princeton Go Club. The tournament director was Paul Matthews. Certificates and cash prizes were given to the following winners: New Jersey State Championship ($500/$250/$150): 1st: Zhaonian (Michael) Chen 7d; 2nd: Zhongxia (Ricky) Zhao 7d; 3rd: Minshan Shou 7d. 5 Game Winners ($80): Forest Song 5d; Gyuhyeon (David) Sim 3d; Julian Erville 6k. 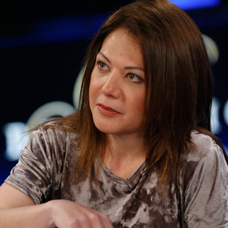 4 Game Winners ($50): William Lockhart 5d; Sudhir Vel 4d; Kelsey Dyer 2d; Nathan Borggren 2d; Joshua Guarino 1d; G. Nicholas D’Andrea 2k; David Shin 4k; Ilhee Kim 5k; William Xu 5k; Gurujeet Khalsa 7k; Joyce Hong 9k; Quentin Berthet 10k; Sean Burton 10k; Zeshi Du 11k; Zachary Rudi Schanne 12k; Christopher Cho 17k; Zhi Liu 17k. Complete tournament standings, including updated ratings and all game results, can be found at the Go Tourney Ratings website. 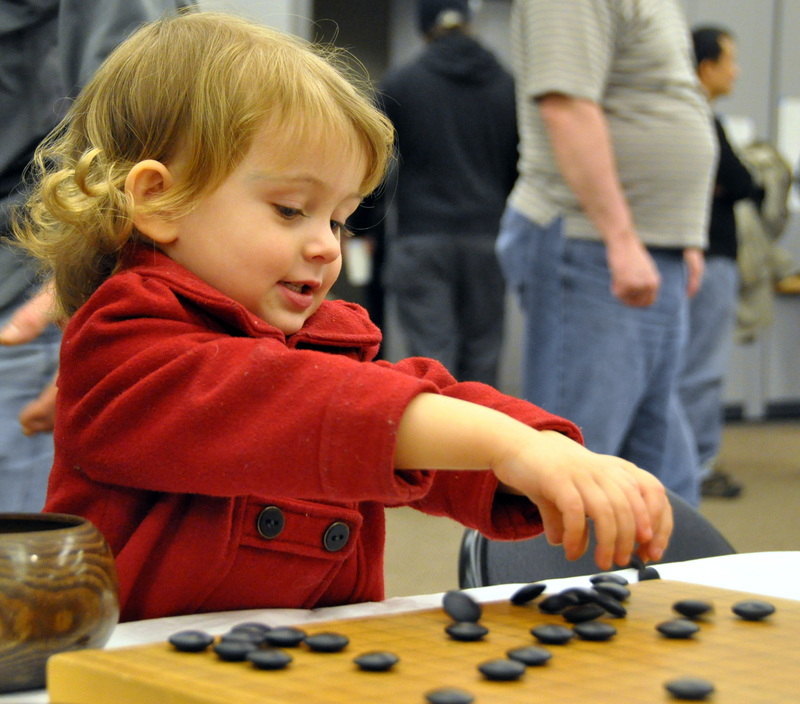 photo: possible future NJO champion Yvette Lapidus, daughter of Carrie & Saul Lapidus, practices her two-handed tesuji Sunday, Feb. 26 at the NJO; photo by John Pinkerton. 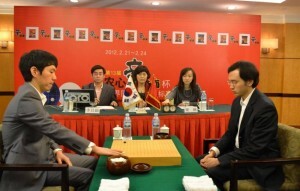 The first three rounds of the second Young Kwon National Online Tournament (YKNOT) will kick off this weekend. A field of 70 players from 16 kyu to professional will vie for nearly $3,000 in prizes sponsored by former US Open Champion Young Kwon. The tournament will provide high-level competition for participants, and the open section will be scored as a North American Ing Masters (NAIM) Qualifier. The player field will include professional players Mingming Yin and last year’s YKNOT champion, Zhanbo Sun, both of New York. Tune into the AGA Tournaments Room on KGS this weekend and next to watch the games. The tournament will be directed by a team including TD for Pairings Chris Kirschner, and online TDs Dennis Wheeler, Tina Zhang, Kevin Hwang, and Karoline Burrall. Tournament schedule and rules can be found at the tournament website. Winner’s reports for the 2011 North American Ing Masters (NAIM) and the 2011 U.S. Go Congress Strong Players Open (SPO) have now been posted; a similar PDF report for the 2011 U.S. Open is expected soon. Click here for crosstabs on the major Congress tournaments 2008-2011. Lillian Zavala 9k and Ogam Shakti 15k led the top division of the Mexican Youth Go Championships, held Feb. 11 in Mexico City. 44 kids attended the event, which was limited to those under the age of 12. “We had the support of some of the pioneer go players in Mexico,” reports Mexican Youth Coordinator Siddhartha Avila. “Dr. Marcos Arámbula helped organize, and Dr. Ricardo Quintero was the referee, both were active in the 80′s, when the game was almost unknown in Mexico. The kids had a great time at Ekoji Buddhist Temple where the tournament took place, a special thanks goes to Rev. Todaka and the Temple’s staff for kindly hosting the event. Before the tournament we saw kendokas training at their dojo, with them, the garden, the altar, the statues, tatami rooms, go boards, bowls and stones, the atmosphere took us for a moment on a trip to ancient Japan where Igo has been practiced for so long. Santiago Dimayuga, a 6 year old child with autism played in Section C, reaching 4th place. He has been playing for just a couple months, with the support of his Teacher Ana María who taught him the basics; this is a great achievement, he seems to like go very much. This proves once again the inclusive nature of go, and how we can break barriers through its practice. This experience broadened our vision about teaching, and there are talks about making a deeper approach in the field of go and autism. In Section A there was a tie between Lilian Zavala 9k and Ogam Shakti 15k each with 4-0 records, the final will be played soon, Vicente A. Cortez 14k came in third place. Omar Zavala 13k won Section B, followed by Hans Torres 20k and Fernando López 20k. Section C was topped by Leonardo Pineda 24k, second place went to E. Amélie Zdeinert 24k and third place to Ximena Tejada 25k. 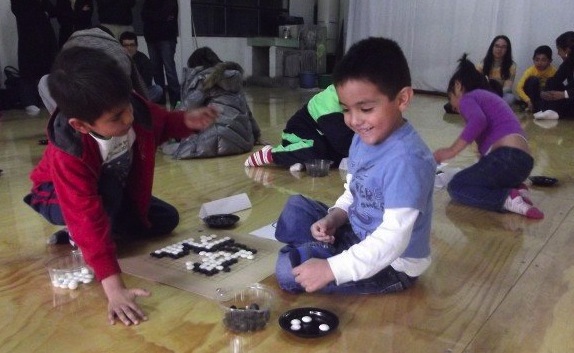 We would like to thank all the teachers, parents and volunteers for their support in making this event possible, as well as the American Go Association for their prize sponsorship – the winners had nice sets of Yunzi stones as prizes,” writes Avila. Full Results are here, a photo gallery is here. -Paul Barchilon, E-J Youth Editor. Photo and report by Siddhartha Avila. The Collegiate Go League, a new competitive league for university go clubs, is attracting new schools and players. Funded by the Ing Foundation, the group was created by eleven college students from the US, who attended the first ever Shanghai Ing Foundation China Summer Go Camp. The team experienced Chinese culture first-hand and played friendly matches with students at Shanghai Jiao Tong University, Beijing Normal University, and Fudan University. “We organized our US league to create a stronger network of school-based go clubs,” writes Brian Lee. “We’ve successfully held two rounds of matches, with 4, then 6 schools. We’re in the process of inviting more schools, and we’ve got at least 8 teams slated for our next match on March 3rd.” Matches are held on the KGS Go Server, in the “Collegiate Go League” club room. Every other week on Saturdays at 1pm EST / 10am PST, school go clubs field a team of five players. “Games are handicapped, and after the matches, strong players will be available to review games, giving a chance for kyu and dan-level players alike to improve and meet other players in the collegiate go community. Current participating schools include: Brown, Brandeis, MIT, Northeastern, Cornell, Princeton, U-Michigan, and U-Maryland. We are looking to add more teams, and would love for you to join us,” adds Lee. The next match is March 3rd, more details are here. -Paul Barchilon, E-J Youth Editor. players participating in the longtime tournament, held at Princeton University in Princeton, NJ. Undefeated after the first three rounds are Xinyu Tu and Zhaonian Chen; top players with 2-1 records are Andy Liu, Minshgan Shou and Ricky Zhao. Top Player results thru Round 3: A Liu: + H Chang; + K Huang, – X Tu; Z Chen: + J Guo; + H Chang; + Z Zhao; X Tu: + K Huang; + J Guo; + A Liu; M Shou: – Z Zhao; + J Wang; + K Huang; K Huang: – X Tu; – A Liu; – M Shou; J Guo: – Z Chen; – X Tu; + H Chang; Z Zhao: + M Shou; + B Lockhart; – Z Chen; B Lockhart: + C Tseng; – Z Zhao; + J Wang; J Wang: + G Shou; – M Shou; – B Lockhart; G Shou: – J Wang; + L Smith; + C Tseng; R Zhang: + J Teng; – C Tseng; + L Smith; C Tseng: – B Lockhart; + R Zhang; – G Shou. Top boards are being broadcast live on KGS; Round 3 is expected to begin around 10:30a EST on Sunday, Feb. 26. Game records are available on KGS; look under USGO1 and USGO2. Here’s the Round 1, Board 1 game between Xinyu Tu (Jimmy Creeks) and Kevin Huang.